Recently, I was with close friends for dinner. One asked the rest of us what we thought of the chakras. Heavy, philosophical discussion ensued…as is only natural at a table full of yoga professionals! One contended that chakras hold the past genetic impressions of our ancestors, and influence the way we move in the world. Another argued that chakras are more complex than we realize, and to try and narrow a “problem” down to only one chakra is an oversimplification. The last wondered if chakras are an overlooked part of the yoga practice, and maybe we need to focus more on them. The chakras are the body’s intuitive way of organizing our psychology. The chakras show us what we hold on to and where we are not yet free. This is invaluable information for you, the #ModernMystic. When we know what we repress, we discover the triggers that keep us from experiencing freedom…or, yoga. The seven chakras provide us with an illuminated roadmap of consciousness (I write about this extensively in my book, Yoga Beyond the Mat), allowing us to discover the patterns and habits that prevent us from being free of pain, shame, guilt, and regret. The chakras affect every single level of our being. Can you even imagine how important this is for us as yogis? As yoga teachers? Unraveling the patterns of distress in the body/mind complex are at the heart of our personal practice, as well as what we do as healers. The chakras are more than just a cool concept, they are an essential element of our work. I am dedicating this week to teaching you more about them! On my Thursday Facebook Live, I talked about how the chakras provide us with a psychological roadmap for our yoga practice, and how we, as yoga teachers and practitioners, can weave them more into our work in practical and grounded ways that create positive change in our students. 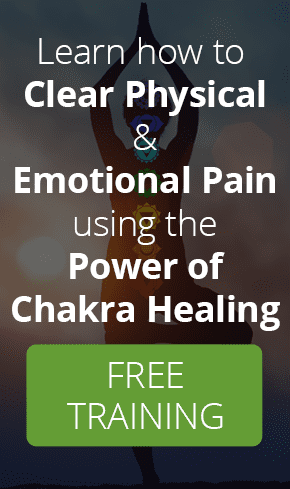 If you’re ready to incorporate the deep healing work of the chakras into your teaching and personal practice, then it’s time to join me for my Alchemy of the Chakras online course that certifies you in Chakra Therapeutics. You learn how to decode the wisdom of the chakras in the body, and utilize their messages as the source of profound healing. Sign up for my upcoming webinar that takes you inside the course and gives you essential info about the chakras! Because the chakras offer so much for our own spiritual development and understanding, I hope you’ll join me for one of these experiences. My goal, as always, is to provide you with the resources you need for your own soul’s growth… the chakras are no exception and are truly at the foundation of my work. I look forward to sharing the wisdom of the chakras with you!